Known as the 'Voice of Tallahassee', Flanigan strives, as always, to be fair and truthful, especially when tough questions must be asked. For years, the familiar voice of Tom Flanigan has commanded the attention of his radio audience. In a media environment more fractured than ever before, listeners have learned that Flanigan’s reports are evenhanded, sincere and valuable. Via the airwaves of WFSU-FM and its sister stations, Flanigan reaches 70,000 people in North Florida and South Georgia. He dissects election returns, conveys hurricane advisories, interviews VIPs and ordinary citizens, profiles new businesses, publicizes nonprofit events and reports news from the Florida Capitol. “It’s so important for us as a community to interact, to communicate with each other so that all the voices are heard,” said Flanigan, interviewed in his office at WFSU headquarters on Red Barber Plaza, where he is program director for news. Listeners say Flanigan democratizes the local airwaves and promotes civil conversations about important subjects. Some call it extraordinary. Natasha Hartsfield, director of education at Tallahassee Museum and a small business owner, said she learns about the community from WFSU-FM and appreciates being able to add her voice to the mix. “Tom’s everywhere with his microphone. He’s at Market Days (a Tallahassee Museum event). He’s at the French Town Heritage Hub. He’s at City Hall and Cascades Park and the Capitol. Everywhere I go, I see him, and he recognizes me, too,” Hartsfield said. Flanigan has interviewed Hartsfield on “Perspectives” several times, given her wealth of information about local wildlife, science for children, workshops on sustainability practices, and more. Flanigan has an agenda: to promote useful conversation. In Frostberg, Maryland, Flanigan’s father was a conductor on a small rail line, the Cumberland & Pennsylvania (C&P). Flanigan calls him his hero, a gentleman who treated others with respect. Flanigan said his parents’ enthusiastic, carpe diem approach to life is part of his DNA. Flanigan has interviewed Gulf Coast oystermen, “Chopped Champion” Shacafrica Simmons, Tallahassee’s “Chef Shac;” Apalachicola River Trek paddlers, youth mentors in the region, physicists, opera singers, beekeepers, and Guardian Ad Litem advocates for minors involved in the court system. Flanigan, characteristically, is quick to share credit with the WFSU news team, especially news director Lynn Hatter and senior producer/assignment editor Regan McCarthy. 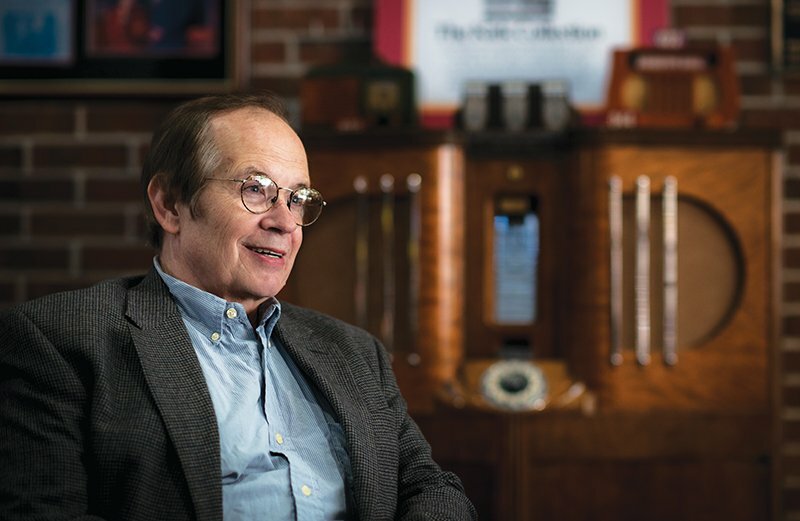 Surrounded by radios at WFSU headquarters in Red Barber Plaza, newsman Tom Flanigan says radio has long been a powerful tool to promote understanding or provoke rancor. 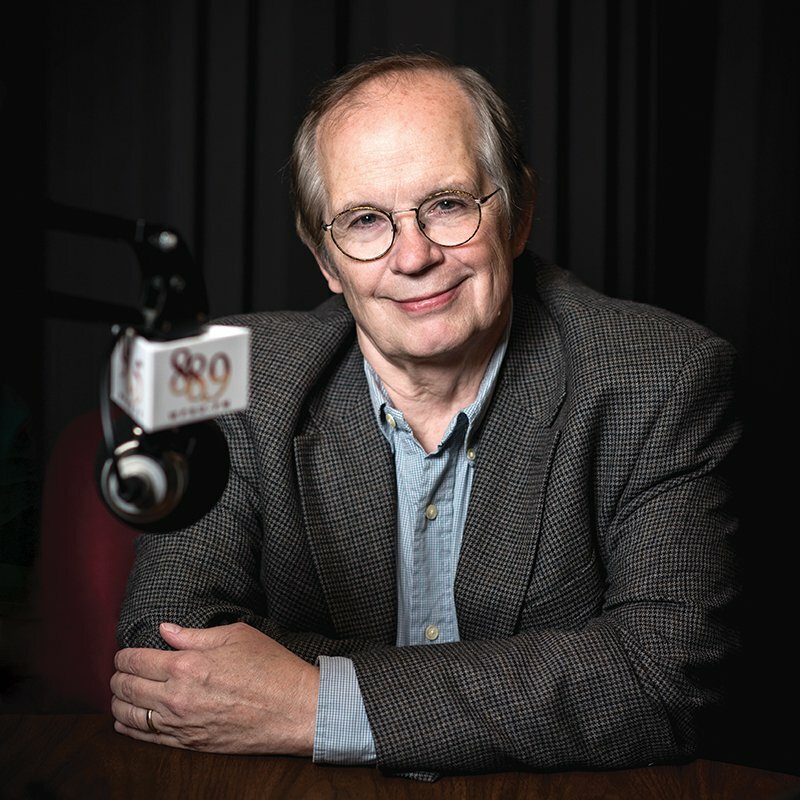 Daily on WFSU 88.9 FM, he broadcasts local programs intended to inform, entertain and surprise listeners. His affection for the community is evident on air and off. “I have had the privilege of working with incredible people over the years,” he said, adding tips of his hat to former colleagues including Rick Flagg and James Call. He has addressed human trafficking in North Florida, drug addiction, suicide, gun violence and the FBI investigation into Tallahassee politics and business connections. Listeners praise him for refusing to steer guests in one direction or another. “Tom allows the organic story to be told. He doesn’t steer a conversation or an interview. He facilitates an objective conversation where things can unfold, like journalism is meant to be,” Hartsfield said. Learning to sort fact from fallacy is more important to democracy than ever, Flanigan said, because proßpaganda is powerful and divides communities into factions. People, Flanigan said, should avoid relying on just one source of information, even if they fit it especially consistent with their point of view. Mayor Andrew Gillum is one of Flanigan’s fans. He has been a guest on “Perspectives” and has called upon WFSU-FM to distribute public-safety information. Likewise, Audra Pittman, executive director of the Council on Culture and Arts, said WFSU and Flanigan, in particular, have been invaluable in developing arts and cultural pursuits. Lending his microphone people who bring music, theater and arts to Tallahassee, Leon County and north Florida makes the region a better place to live, she said. Flanigan is modest in the face of such accolades. He says the fun of capturing and broadcasting sound is still one of the best things about his job. When School Superintendent Rocky Hanna, then principal at Leon High School, agreed to jump out of a plane in response to a fundraising challenge, Flanigan was there. “We were at the Havana airport. He’s talking as he’s getting prepared to go skydiving, and he’s terrified but determined. There were the sounds of the plane, the gear, people talking.